It is far too easy for any organization to overlook the need to be more thoughtful and have better short- and long-term plans when you’re so focused on serving your customers. We’ve been no different but, thankfully, our leadership was able to find a substantial amount of time over the summer and early fall to look at what we were doing, what was working, what wasn’t working, what should remain unchanged, and what needed to be changed. 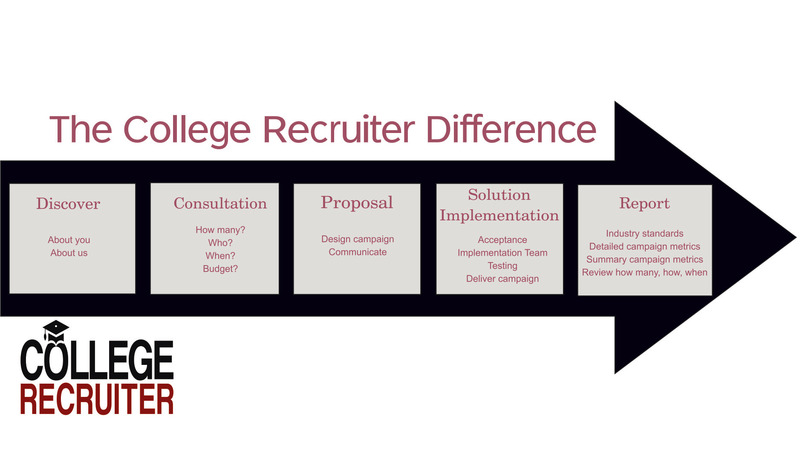 In short, we’ve been doing a lot of strategic planning here at College Recruiter. One of our conclusions was that we saw far better outcomes of our interactive, recruitment media campaigns when we forced ourselves (and sometimes our clients) to follow the process that we’ve developed over the 24 years we’ve been in business. This summer, as part of our strategic planning, we documented that process, gave it a name, and created a graphic to help our team and those with whom we interact an easy-to-follow checklist. 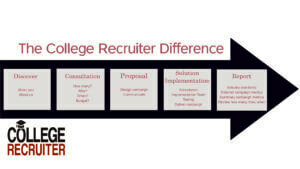 We called the process, The College Recruiter Difference. When a campaign doesn’t succeed, we almost always can trace the problem back to the very first step: Discovery. Did we really understand the goals of the client? Did they? Did we properly communicate to the client how we could solve their goals within their budget or did we just accept their order? For those who have never been in sales, it can be daunting to say no or, more accurately, “not yet” to a client who is ready, willing, and able to buy. But we’d much prefer to help a client hire hundreds each year and for years to come than to hire a handful this month and never work with them again. Once we understand the goals of the client and they understand our solutions, we dive in deeper. How many do they want to hire? How many of those from us? What do those people look like in terms of graduation year, major, experience, school, geography, diversity, languages, and other factors? How soon should the campaign start? For how many months should it run? And what is the budget? Understanding the client’s goals and needs often reveals that there is no way for them to be happy within the budget they have so conversations at that point can be a little difficult yet necessary. We almost always find that the person we’re talking with agrees that the budget is inadequate yet didn’t have the ammunition to go to her boss to get the money needed to properly implement. After consulting with our team, she should be able to do just that. We then move to the proposal stage where we make specific and typically written recommendations. There can be a fair amount of back-and-forth here with the client asking a lot of “what if” questions. Those are great as the client is always going to understand their needs and wants better than we can ever hope to so when they push back, we have an opportunity to refine our recommendations to improve the client’s likely return on investment. We get to implement the solution when the client accepts our proposal. Our sales team hands off the campaign to our implementation team. They set up the campaign, test, make necessary adjustments, test, make necessary adjustments, test, etc. until everything seems perfect. We have a lot of experience and so the first test is typically the last as we don’t run into too many situations where we need to make adjustments. We then deliver the campaign which may mean running the job posting ads, delivering the targeted email campaigns, running the targeted mobile banner ads or targeted display ads, hosting the virtual career event, or getting our data scientists to work on pulling the workforce planning Data and Analytics reports. Speaking of reports, the final stage in the process is reporting to the client. We almost always remind the client of industry averages for whatever we’ve delivered as that puts our results into the proper context. Sometimes we underperform but typically we outperform our direct competitors and so that’s an easy conversation to have. We present detailed and summary campaign metrics so that the client will know what value we delivered and then circle back to the goals of the client. Did we help them attain those goals? If not, was it because they declined to follow our recommendations or was it because we somehow dropped the ball? The review then naturally leads back to the first step where we again discuss with the client their upcoming goals and how we may be able to help them. If your organization does not have a formal, named process for whatever it does, get one. You’ll be amazed at how a simple checklist will keep your team focused and get your clients better traction.